Three employees from the Housekeeping Department at Providence Manor with a combined 131 years of service were celebrated on Wednesday at Providence Manor. The three men were recognized for their outstanding contributions. 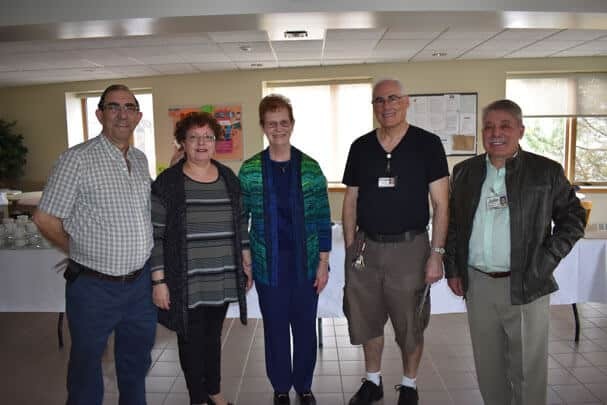 Joe Meireles is retiring with 49 years of service, Domingos Tavares is retiring with 42 years of service, and Julio Medeiros is retiring with 40 years of service. Sister Sheila Langton, former Administrator at the Home was in attendance to honour these individuals. Sister Sheila recalled happy memories of her time at Providence Manor working alongside Joe, Domingos and Julio. “When I think of all of you, I think of the different scenarios I’ve seen you in. Looking after this Home as if it were your own is something I distinctly remember,” explained Sister. That statement was echoed many, many times throughout the celebration. Sister Sheila Langton wished them the best in their retirement. On behalf of everyone at Providence Care, we would like to take this opportunity to thank each one of these men for their contributions throughout the years. Every single day for the past many, many years, they have arrived at work and helped us live the Mission, Vision, and Values of Providence Care. They have all went above and beyond to serve our Residents and their families. We wish you all the best in your retirement and you will be missed!